Fresh Christmas wreaths are already for sale at Trader Joe’s whilst merry Muzak carols are echoing throughout some local corporate pharmacies — but will those pine wreaths still be fresh on December 25th? And how much Christmas cheer can a person reasonably tolerate? Many people I know are complaining about all the current yuletide hype when we have yet to reckon with the Thanksgiving turkey. But Bodhi Tree Concerts can be forgiven for its too-early wassailing for several reasons. 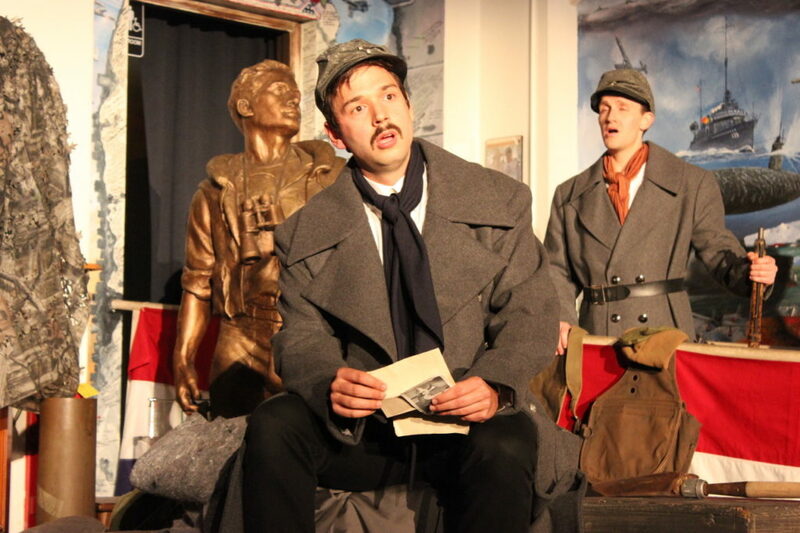 First, All Is Calm: The Christmas Truce of 1914, treats an historical happening which is perennially fascinating. And the show is also relevant around the time of Veterans Day. But chiefly, it’s very good. Because I was unable to attend the public performances this weekend, I was invited to a dress rehearsal Wednesday night in the Veterans Museum at Balboa Park, a building that once served as the chapel of the Naval Hospital on Inspiration Point. Normally a dress rehearsal is not reviewed by the press or in online blog, so I offer only some “preview” remarks. Rather enthusiastic ones, to be sure. All Is Calm is a deftly assembled collection of Christmas musical selections and of first-hand accounts from the men who fought and died in the Belgian killing fields of World War I. Though it is difficult to fathom thoroughly, the Christmas spirit so moved German and British troops that they emerged from their trenches to play soccer, sing carols, exchange photographs, and do all sorts of incongruously kind and loving things during a lull in the bloodshed. They sang “Auld Lang Syne” as they buried the dead, traded rum, chocolate and cigars — and then went on for another four years of mud, blood, lice, sickness and slaughter. In All Is Calm they also sing “It’s a Long Long Way to Tipperary,” “Will You Go to Flanders? and “Silent Night” in both German and English. We even hear from a French opera singer in a moving rendition of “Cantique de Noël” sung by tenor Timmy Simpson. As a whole, the show is rewarding musically in that it takes many overly familiar tunes and makes them fresh and compelling. On the other hand, a great deal is not that familiar. All of the songs sung in this show are listed at the very bottom of this page. 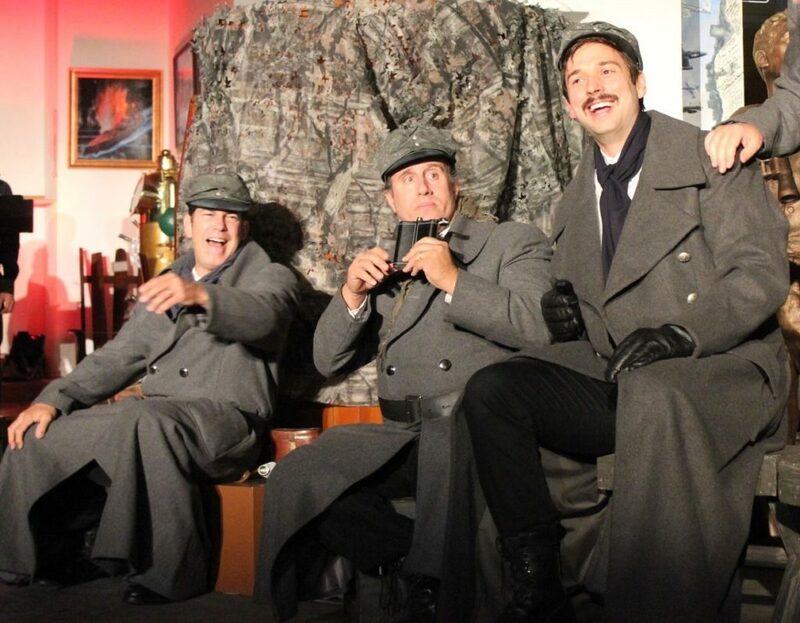 Camaraderie, pain, regret, and joy: the rich, sonorous voices of the men of Sacra/Profana bring “the war to end all wars” to poignant immediacy. Six featured soldier/singers perform the main action — the readings of the documents, each with its tagline ID. Ten more singers stand in the background, all dressed in black, each man wearing a red memorial poppy. All is a cappella under the direction of Juan Carlos Acosta. Despite the uncomfortable folding chairs, it’s probably impossible to improve upon the Veterans Museum venue. The old chapel adapts well and the acoustics seem fine. The collection of memorabilia is superbly displayed and worth examining with or without a wonderful concert such as this one to attend. For music, drama and dance critics, the holidays can be wearying with the same old stuff over and over. Pulitzer Prize winning critic Martin Bernheimer once wrote, “Another ‘Nutcracker’! Ah, well. It’s dirty work but somebody has to do it.” All Is Calm is not only a deeply moving and musically satisfying show, but it’s a wonderful relief from the same ol’, same ol’. FEATURING: Alvin Almazan, Walter DuMelle, Jack French, Timmy Simpson, Michael Sokol, Christopher J. Stephens. 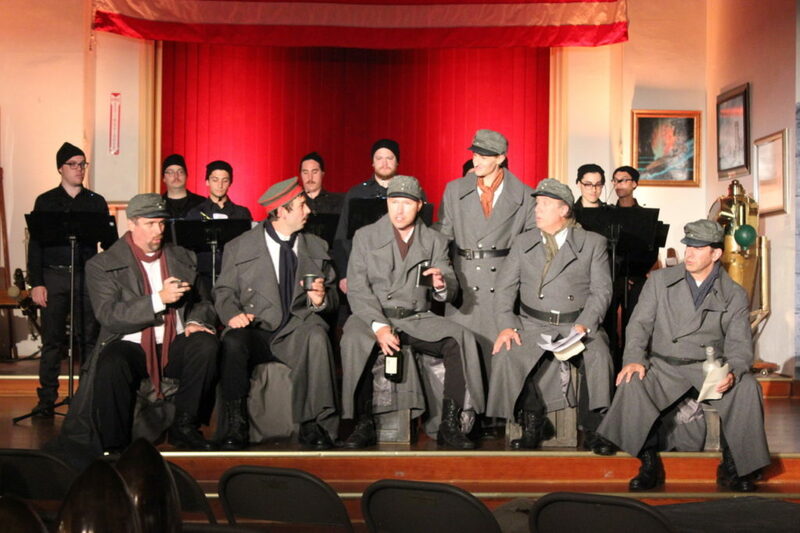 And the Men of SACRA/PROFANA: Colin Barkley, R. Aaron Bullard, Adam Davis, Brad Fox, Jonathan Gonzales, Kenneth Martin, Nicholas Root, Mitch Rosenthal, Kurt Wong, Paul Young, Jr.
PART II: THE GRIM REALITY: “It’s a Long Way to Tipperary”. Jack Judge & Harry Williams. “Les Godillots”. Paul Briollet & Eugene Rimbault. “Pack up your Troubles in your old Kit Bag.” George Henry & Felix Powell. “The Old Barbed Wire”. English Traditional. “I Want to Go Home.” Lieut. Gitz Rice. “Deutschlandlied”. Franz Joseph Haydn. “Keep the Homefires Burning”. Ivor Novello. “O Come, O Come Emmanuel.” 12th Century Chant. PART III: CHRISTMAS : “Christmas in the Camp”. Harrington and Scott. “We Wish You a Merry Christmas.” English Traditional. “Die Wacht Am Rhein.” Karl Wilhelm. “Christmas Day in the Cookhouse”. English Traditional. “O Tannenbaum.” German Traditional.